Here are some software goodies that I use on a daily basis. They don’t cost much, but man do they make a difference. Keyboard Maestro lets me assign shortcut keys to just about everything. I can press F9 and bring up the calendar, F10 for the address book, F12 for the calculator, and so on. Extensive testing here at Boyce Labs has proven that pressing a key to launch a program is approximately 100 times faster than using a mouse, saving you at least a couple of seconds many, many times a day. But launching programs with one touch is just part of what it does. Keyboard Maestro can execute macros (sequences of events) at the touch of a key as well. 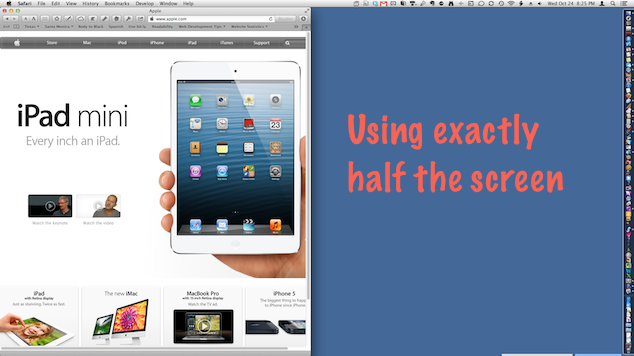 For example, suppose you want your Mac to read a web page to you out loud. You may know the steps: turn on the “Reader” feature in Safari, select the text, then go to Edit/Speech/Start Speaking, but who wants to do all that? It’s easy to let Keyboard Maestro do it for you, at the press of a key. For another example, suppose you want to automatically quit the Microsoft Office Reminders program that pops up every time you restart your Mac. Keyboard Maestro can keep an eye out for Office Reminders, automatically sending it a “Quit” command as soon as it launches. The examples above are actually things I use Keyboard Maestro for here. Yes, it takes a little work to set things up, but it’s worth it. Teach Keyboard Maestro to do some of the menial tasks that slow you down each day and you’ll free up your mind for bigger things. Keyboard Maestro: $36. Free trial available. Click here for three videos demonstrating Keyboard Maestro’s features. Typinator is a text expander: it watches what you type, and when you type certain sequences, it changes them into something else. For example, if I type “cbem” (4 characters) Typinator changes it to “macman@christianboyce.com” (25 characters) in the blink of an eye. I can get “Christian Boyce and Associates” (30 characters, complete with proper capitalization) by typing “cba” (3 characters). I can even assign the same expansion to two shortcuts– for example, I’ve set it up so that “cb&a” also expands to “Christian Boyce and Associates” because I know I won’t be able to remember whether I used the ampersand in the shortcut or not. Typinator is incredibly fast– you’ll never have to wait for it. Just type away and let Typinator clean up after you, saving you lots of keystrokes and fixing spelling and capitalization. It’s also incredibly powerful– I can type “ds” and get a date stamp (like this: Sunday, October 21st, 2012), and I can type “cbface” and Typinator replaces it with… you guessed it.. my face. Typinator’s great. I don’t know what took me so long to discover it. 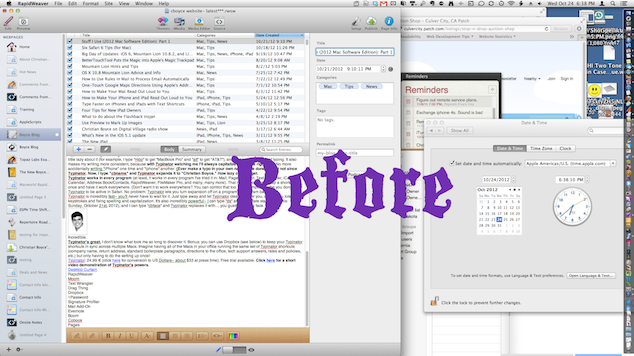 Bonus: you can use Dropbox to keep your Typinator shortcuts in sync across multiple Macs. Imagine having all of the Macs in your office running the same set of Typinator shortcuts (company name, return address, standard boilerplate paragraphs, directions to the office, tech support answers, rates and policies, etc.) but only having to do the setting up once! Typinator: 24.99 € (click here for conversion to US Dollars– about $33 at press time). Free trial available. Click here for a short video demonstration of Typinator’s powers. Desktop Curtain does a very simple thing– it makes your Mac’s desktop look neat and clean– and it does it very well. A touch of a button is all it takes to go from messy to neat. I don’t know about you, but for me a messy Mac is distracting. I like to focus on the thing I’m working on. Desktop Curtain takes care of that for me. Check out these before-and-after pictures. I only wish I could apply “Desktop Curtain” to my real desk (and my dining room table, and my bedroom floor). Now that would be a trick. Desktop Curtain: $5. Free trial available . Watch the video here. Here’s a big waste: a giant monitor and a single window filling it up (see below). 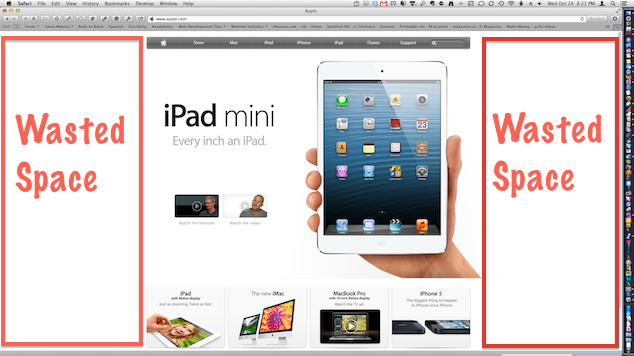 The actual content of the web page shown below would fit just fine in a window half the size. In that case, it would be possible to have two windows open, side by side, in the space that currently displays just one. That last picture shows two websites, each taking EXACTLY half the screen. It’s perfect. 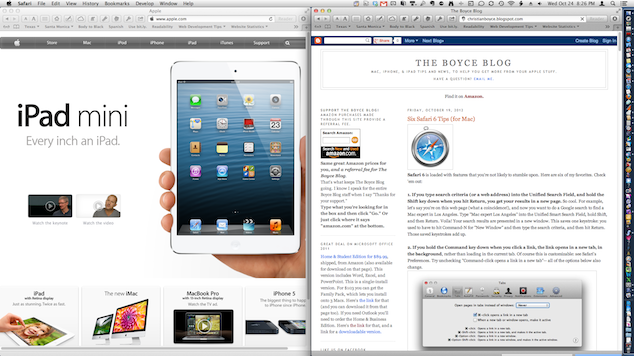 The only problem is, it’s a pain to move windows around and resize them precisely, so hardly anyone does it. Instead, we just click the green “zoom” button and make each application’s windows take up the entire screen– even if half of the window is empty space. Enter “Moom.” Moom means “Move and Zoom” and it makes arranging windows really easy. Moom gives each window’s green-dot zoom button super-powers, allowing you to move and resize a window with a single click of the mouse. No more clicking the green-dot zoom button and being surprised (and disappointed) when the window does not resize as expected. No more “first we move the window, then we resize it” stuff. Now, with Moom, it’s one touch. The bigger your Mac’s display the more Moom can help you, because the bigger your Mac’s display the more potentially wasted space. Moom helps you get more out of your display and it works in every program that has a standard green-dot zoom button. For $10 it’s a no-brainer. Moom: $10. Free trial available here. Demonstration video here. 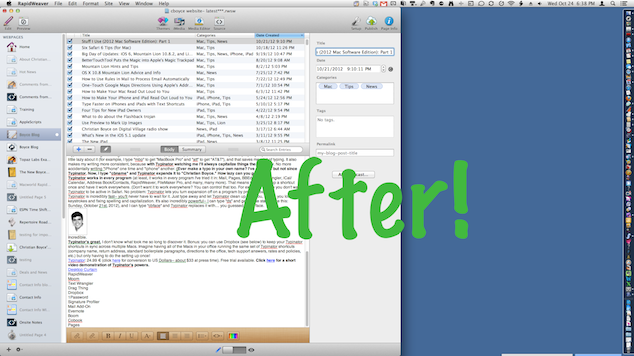 Signature Profiler adds advanced features to the Signature part of Apple’s Mail program. It lets you use “placeholders” in your signature(s), filling them in the moment you create a new email. The placeholders can include quotes taken at random from a list you create, or the name, artist, or album you’re currently listening to in iTunes, or information related to the email account that you’re writing from. I use Signature Profiler to keep my email signature up-to-date with a link to my latest blog post, and it’s all automatic. Setting it up took a little thinking but after that it’s been easy. if you send a lot of email, and you’d like your signatures to be snappier (and a lot more dynamic), Signature Profiler is exactly what you need. There you have it. Five great bits of software that make my Mac life a whole lot better. They’ve helped me to do better work, more easily, and more pleasurably, day after day after day. Check ’em out for yourself and see if you don’t agree. I think you will.